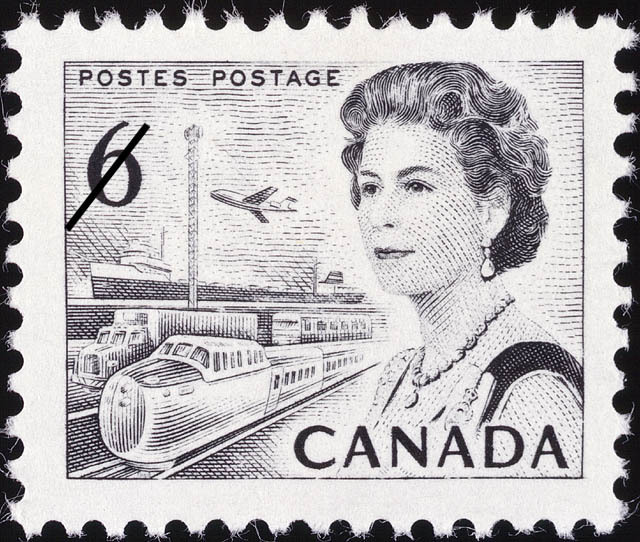 The value of a Queen Elizabeth - 6 cents 1970 stamp depends on several factors such as quality and wear, supply and demand, rarity, finish and more. Values in the section are based on the market, trends, auctions and recognized books, publications and catalogs. This section also includes information on errors and varieties and characteristics. The re-issuance of Canada's 6 cents 1968 definitive stamp in black, a colour with superior qualities for detectance by electronic recognition systems, is an outgrowth of the increased employment of mechanical facer-cancelling equipement. 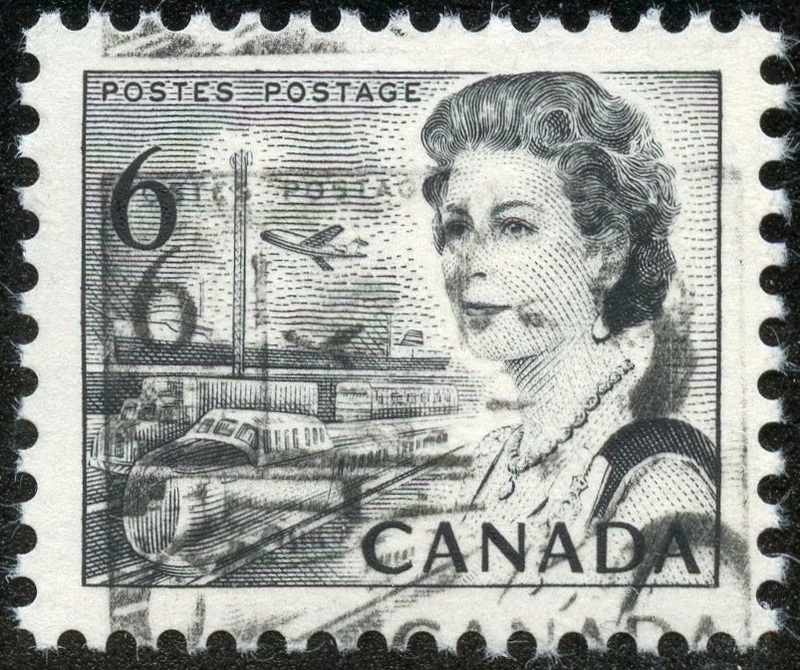 This stamp, orginally issued in an orange shade on November 1, 1968, is campatible with the 5 lower denominations in the definitive series all of which include symbolic views of Canada's major economic regions. In each instance the image of Queen Elizabeth is inserted at the extreme right as an acknowledgement of the constitutional Head of State. Communications and transportation, vital services in linking the vast reaches of Canada, are given recognition on the 6 cents value. The microwave tower, part of a coast-to-coast system supplementing land-line and cable connections, is symbolic of communications. Transportation is illustrated by a variety of land, air and water vehicles. Main Street in Canada, a dream for decades, became a reality in 1962 with the completion of the Trans-Canada Highway. This vast one billion dollar project, coordinated by an Act of Parliament passed in 1949, stretches more than 4,800 miles from St. John's, Newfoundland, to Victoria, British Columbia. The achievements in the 1880's when the nation's Pacific coast province, British Columbia, was first linked with the eastern provinces by a transcontinental rail line. Approximately 65 miles of railway track were in existence in all British North American Colonies in the year 1850; by 1960 the ribbons of steel exceeded 2,000 miles. Since Alexander Graham Bell's Silver Dart achieved Canada's first airplane flight in 1909, conquest of the air has made vast contributions to the nation's economy and to communications with remote areas. In 1920, the first coast to coast flight, organized by the Canadian Air Board, required a flying time of 45 hours from October 7th to October 17th. Waterways had been the whiteman's first highways and a development of these natural routes was synonymous with the spread of commerce. Nature's barriers in the form of waterfalls and rapids have been overcome by vast engineering works, the most notable being the St. Lawrence Deep Waterway's Project. Completed in 1959, the Seaway transformed inland lake cities into seaports and enables all but the largest seagoing vessels to steam 2,000 miles inland.